About three years ago, I and several birdnuts were allowed access inside the fenced compound of the Bataan Nuclear Power Plant through the recommendation of the Provincial Tourism Office of Bataan. There are quite many species of birds inside the restricted area because of its lush vegetation and secured nature. No hunter or poacher can enter and do harm to the feathered creatures here. The nuclear plant itself is mothballed, still unfueled, and I hope it remains non-operational forever. 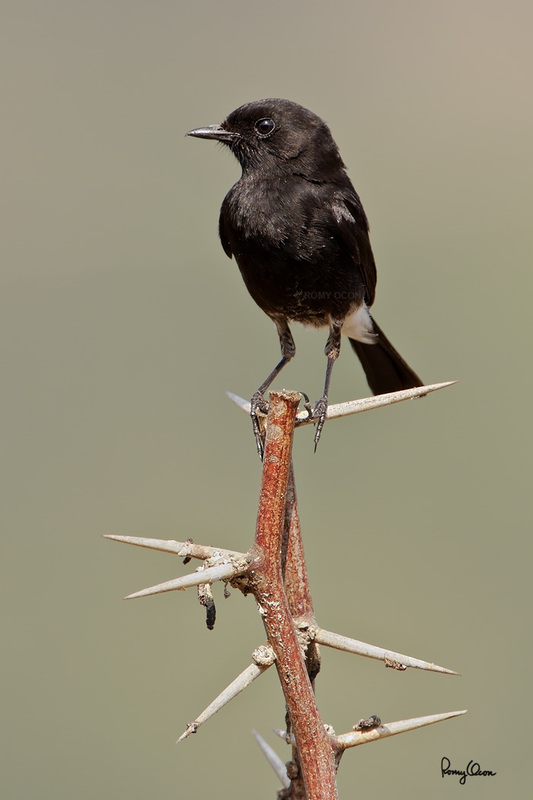 This male Pied Bushchat was foraging in a grassy area near the nuke plant. I used my vehicle as a mobile blind to get very near this normally shy bird, which is found in all major Philippine islands. It is a mere 5 inches in total length, so it is about lifesize as posted when viewed through 96 dpi displays. The female is mostly mottled grey brown in color and looks very different from the all black male. Here are some video footage of a female fimed in-habitat at Candaba wetlands. Habitat – Drier open country, grasslands and cultivated areas. Shooting Info – Bataan Nuclear Power Plant, Morong, Bataan, Philippines, Canon 40D + EF 500 f4 IS + Canon 1.4x TC II, 700 mm, f/8, ISO 250, 1/250 sec, manual exposure in available light, bean bag.